Fibromyalgia is a somewhat confusing and painful condition that remains surrounded by questions in the medical community. We don’t yet know what exactly causes it, but it is a very real condition that affects many people characterized by widespread pain often accompanied by fatigue, depression, sleep disturbance, cognitive impairment, and digestive and urinary symptoms. It is a poorly understood disorder because pain signals processed by the brain appear to be exaggerated, amplifying the sensation of pain in muscles and soft tissues. It can be very confusing and painful for patients, but there is some good news. It is encouraging that the progression of fibromyalgia research has provided new knowledge about centralized pain. This is already leading to better, more effective treatment for people with fibromyalgia. 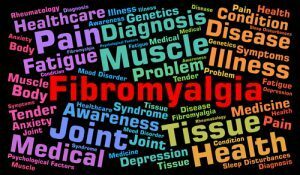 However, another factor that makes fibromyalgia a difficult disorder to diagnose is that there are currently no tests to identify it. It can only be diagnosed by excluding other possible causes. But we know that fibromyalgia is about more than just muscle aches and joint pain. It often involves persistent, widespread pain that may move through the body in waves, causing sensations described as throbbing, diffuse, intense, or stabbing. Another thing we do know is that fibromyalgia sufferers tend to have unusually high concentrations of two chemicals: substance P and glutamate. Substance P is believed to transmit pain information to the brain, while glutamate transmits chemical messages from the brain to the rest of the body. With elevated levels of both, the pain messages to and from the brain may be over-exaggerated. While fibromyalgia is recognized as a syndrome by the medical community, there remains debate as to whether it is a purely physical disorder that is influenced by depression, anxiety, sleep problems, or other concerns that can enhance the perception of pain or affect neurological function. Gender. Women are nine times more likely to have fibromyalgia than men. Some suggest that decreases in estrogen during menstruation (or at the onset of menopause) may trigger symptoms in some women. Age. Although the disorder is often thought of as affecting post-menopausal women, fibromyalgia is most often diagnosed between the ages of 20 and 50. Children can also have fibromyalgia. Stress. When stress is accompanied by sleep problems, the perception of pain is further heightened as well as the risk of fatigue and depression. Genetics. Research suggests that having a parent or sibling with fibromyalgia significantly increases your risk. At Southside Pain Specialists, we often tackle fibromyalgia by taking a multi-disciplinary approach for pain management and symptom relief. Medications, cognitive behavioral therapies, and gentle exercise, such as yoga, are the most common combinations. In partnership with a healthcare provider, such as Southside Pain Specialists, we can develop pain management strategies and long-term health goals that may reduce the chronic symptoms and the frequency, duration, and intensity of periodic flares. Southside Pain Specialists is your one-stop shop for pain management.